Heirlooms Reunited: Photograph of John Dalton Clark, age 3 yrs, 10 mos. 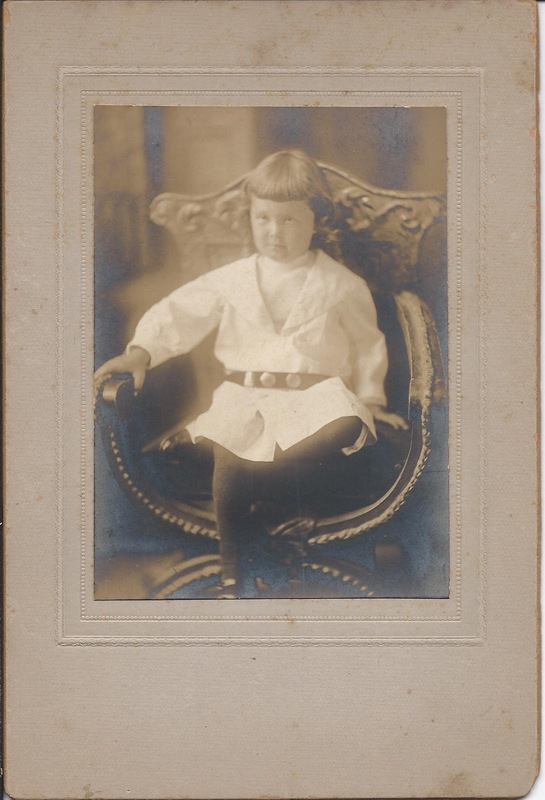 Photograph of John Dalton Clark, age 3 yrs, 10 mos. 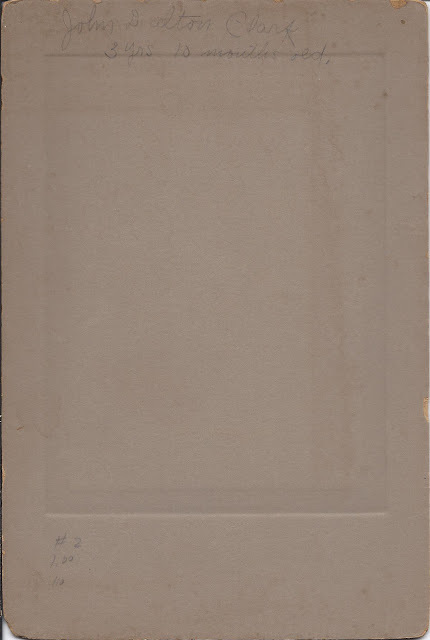 Photograph of a boy identified on reverse as John Dalton Clark at age 3 years, 10 months. Sadly, there's no photographer's imprint to give a clue to locale, but the photograph was purchased in Maine. Right away I found two possibilities: John Dalton Clark, born in Winterport, Maine, in 1908, and John Dalton Clark born in Massachusetts in 1890. Hopefully a family member of either John Dalton Clark, or another one, will happen upon this post and recognize the family characteristics in the boy's face or the handwriting on the reverse. John Dalton Clark was born 10 August 1908 at Winterport, Maine, son of Fred and Charlotte T. "Lottie" (Brackett) Clark, born in Winterport, Maine, and Frankfort, Maine, respectively. His paternal grandparents were Edward and Rebecca (Colson) Clark. His maternal grandparents were John and Mary (Page) Brackett. John Dalton Clark died at Winterport, Maine in 1974. The Massachusetts John Dalton Clark was born 15 November 1890 at Gardner, Massachusetts, son of William and Marana A. (Morse) Clark. I believe he married Mary Sundler, daughter of Gustaf and Amanda Sundler, Finnish immigrants to Gardner, Massachusetts. If you have any corrections and/or insights regarding the information above or an alternative identification for the boy in the photograph, please leave a comment or contact me directly.